Help-yourself snack services in taxis was called off by local authorities on Friday. Help-yourself snack services in taxi in Shanghai on May 15, 2018. Help-yourself snack services in taxis was called off by local authorities on Friday because the service conflicts with regulations. 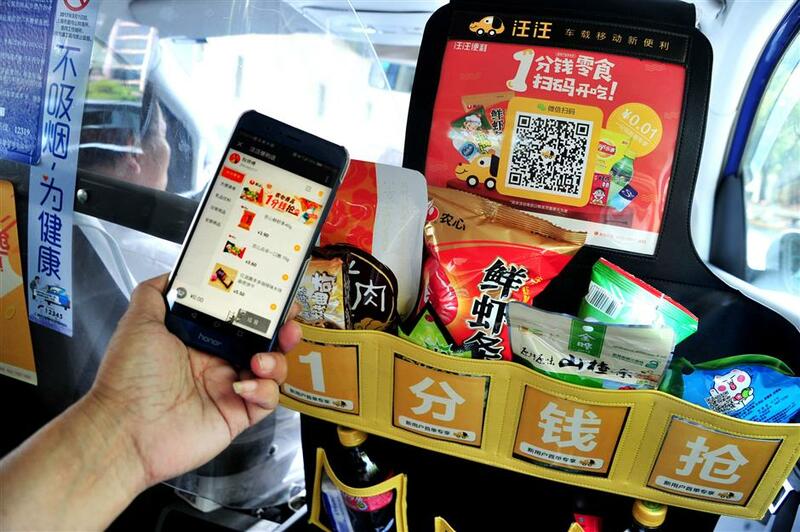 The Haibo taxi firm started to try the new business out with the Wangwang vehicle-mounted convenience store app from March. About 200 Haibo taxis were equipped with pouches filled with snacks and drinks that customers could consume after paying via the app. The goods in the taxis were often cheaper than similar items found in supermarkets. The authorities stated that selling food and drinks in taxis can impact both the driver and passengers as it involves driving safety and food safety. According to the Pudong Market Supervision Bureau, they will sit down with the Food and Drug Administration and snack pouch operators to discuss whether permission should be given. The seat-back convenience stores have so far encountered many problems. For example, the pockets of snacks and drinks hang on the back of the front passenger seat, which is a blind spot for the driver — if a passenger was to tamper with the food, the driver wouldn't be able to notice. Meanwhile, the water in the pocket may fall out if the taxi makes a sudden stop, which may injure passengers. Haibo taxi firm said they have halted the service and removed the pockets from their taxis.